Around Easter time, I have a lot of fun thinking of creative ways to fill my son's basket. Some of my favorites items that I like to include are healthy snacks, small quality toys, learning trinkets, and flash cards. Books are another great addition to any child's Easter basket. From stories of chicks and bunnies to faith based ones that depict the true meaning of the holiday, books can be a fun surprise for children, while offering extra developmental and educational benefits. Whether you've been reading my blog for a while now or even for a short time, you may have guessed that I'm a huge advocate for early childhood reading. I'm blessed to be raising a little lover of books, and truly enjoy being able to share our passion for books with my readers in the form of recommendations, reviews, and giveaways. On that note, I'm happy to be offering a brand new giveaway to my readers, which I'm extremely excited about! 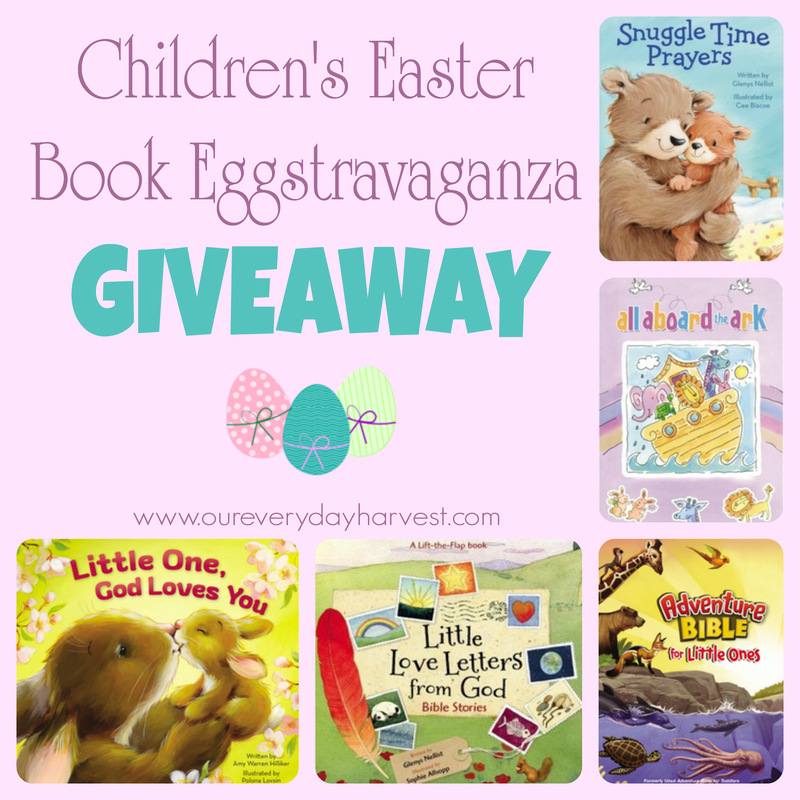 I have partnered with Zonderkidz (the children's division of Zondervan Publishing) to offer one winner five very special board books that are near and dear to my heart. These books will make a wonderful gift for young children during this very important time of the year when we honor the resurrection of Christ. Little Love Letters from God: This precious little flip book book not only shares special Bible stories for children, but sweet sentimental love notes to your child from God. These notes can be personalized for your child, reminding them how much they mean to God and how dearly He loves them. The Adventure Bible for Little Ones: This is a mini Bible made for young children. Rather than a full on Bible, it specifically highlights the many popular stories kids will delight in learning about, including Noah's Ark, David and Goliath, The Ten Commandments, and Jesus' birth. Little adventure seekers will have fun reading each story as they enjoy the amazing illustrations. All Aboard the Ark: Every child should have a book about Noah's Ark in their collection–the rain, a boat, the ANIMALS! Not to mention a very important lesson on having faith in God. This particular board book version includes adorable pastel illustrations and depicts this popular Bible story in a fun way that little ones will really enjoy. Snuggle Time Prayers: Another treasure in Glenys Nellist's (author of Little Love Letters from God, above) collection of children's ministry. Containing a collection of short heartwarming prayers, this is a wonderful book that teaches young children how to pray in a way that they can understand. It's also the perfect "snuggle time" book for any time of the day. Little One God Loves You: No Easter basket can be complete without a bunny themed book. This delightful gem is based upon the Purpose Driven Life. Following a little bunny as he goes about his day, children will learn about God's great love for them and the purpose that He has for their own lives.